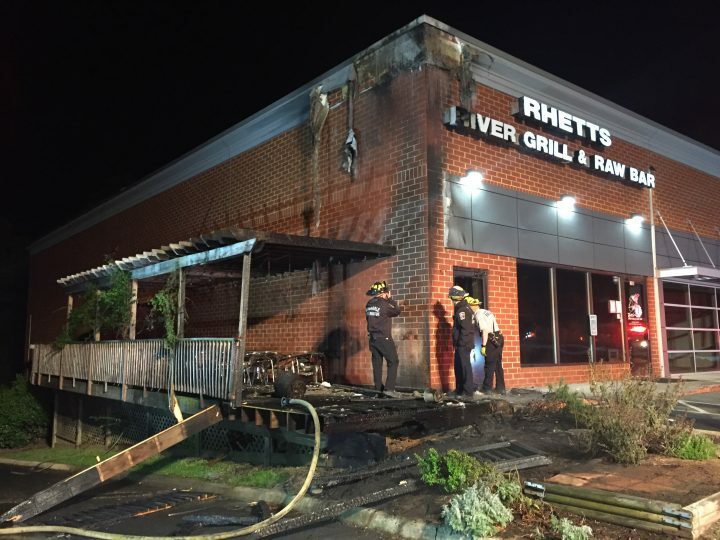 Firefighters responded early Wednesday morning to reports of a structure fire at Rhett’s River Grill and Raw Bar on Seminole Lane. Upon arrival, Engine 82 reported flames showing from the front of the building and quickly deployed a hose line. Within minutes, fire that had consumed the restaurant’s wood patio and exterior walls was extinguished. Tower 88 was used to make roof access to the building for overhaul efforts. With rapid intervention by Engine 82, the fire was stopped at the exterior of the strucutre and forunately never worked its way to the interior of the building. The cause of the fire remains under investigation by Albemarle County Fire Marshal’s office. Some images on stvfd.org are used with permission from Justin Ide Photography.